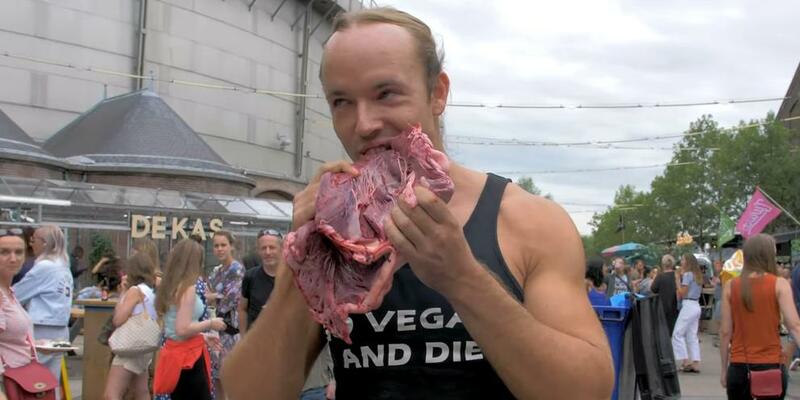 A man in Amsterdam might have given some liberal vegans a dose of their own medicine when he staged his own odd protest in their food festival. He ate raw meat in an obviously vegan event. Attendees to the vegan food festival reported the man to the police. The police responded and confronted the man for his defiant act in the first vegan food festival ever to be held in the Dutch capital. In the video, a woman was even heard saying, “he is just eating it!” It was captured on a smartphone. The man did not reveal his name and was initially reluctant to leave the event, standing his ground that there was no rule stating that he cannot stay in the vicinity of the festival. The meat-eating man eventually relented. The police said it is for the peaceful conclusion that no charges were made against the man, and he was allowed to just go. Non-vegans are becoming more aggressive, it seems, in fighting back the protests of vegans. Just last week, Last week, a butcher was recorded aggressively swinging raw meat at vegan protesters who were carrying out a “silent protest” in front of his market stall. I think that he should have eaten a tasty looking beef sandwich instead. It would have looked better. I’m so sick of all this vegan soy boy crap.